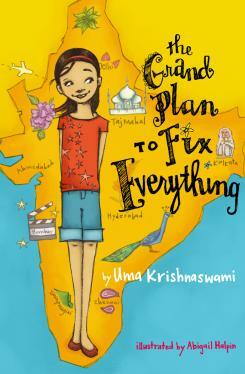 Bubbly, colorful, and exciting, THE GRAND PLAN TO FIX EVERYTHING by Uma Krishnaswami is as entertaining as the best Bollywood "fillums." A middle-grade read stuffed with romance, adventure, and mystery, this entrancing book published by Atheneum was starred by Kirkus and Publishers Weekly. Travel with Dini to Swapnagiri, India, where practicing a little "dekho, dekho" (look, look) and "shuno, shuno" (listen, listen) will lead to a happy-ever-after ending that makes everyone feel like dancing.